Wine Tours of the Hermanus wine regions offer you a very wide selection of incredible award winning wines, at wine cellars that have achieved many accolades from international and local Wine journalists and Wine judging connoisseurs. 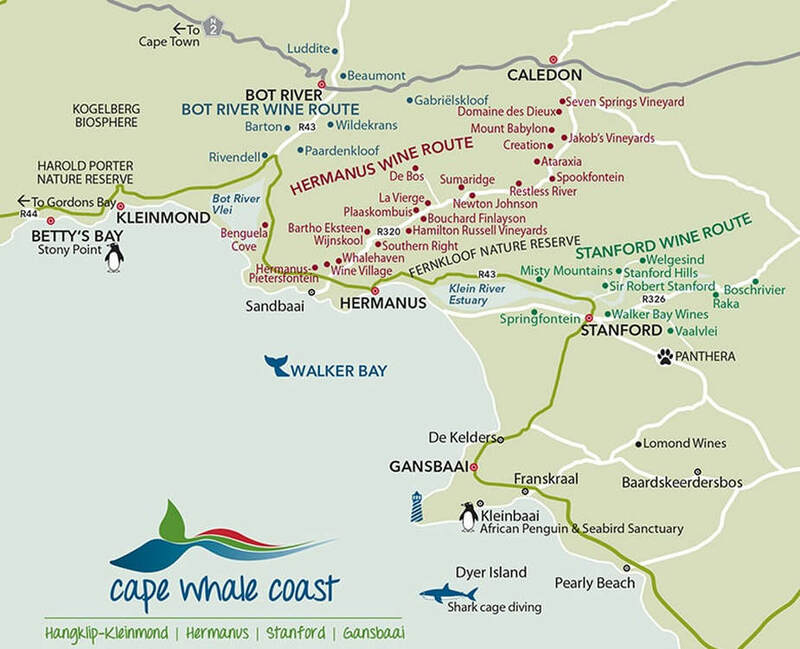 (ALL the local wineries are listed on our Hermanus Wineries page). We collect you door-to-door and supply - a luxury air-con minibus with Chauffeur Wine Tour Guide, who has completed wine exams with the Cape Wine Academy, so that we can discuss all sorts of wine related topics - its history, vine and grape growing processes (Viticulture), cellars, bottling, corks, barrels, wine making (Viniculture), exports, imports and much more........while you slowly sip each delicious wine. With such outstanding natural scenery, we usually start our Wine tours with a quick zip up onto the high mountains of Hermanus at Rotary Way, as this gives you a fantastic birds-eye view of the Hemel-en-Aarde wine valley and we will do a quick explanation of whats what in this very fertile agricultural valley and then go onto the look-out point that is 350m above Hermanus and allows an incredible view of the town, the beach and the entire ocean of pretty Walker Bay. While we present a jovial and informative explanation of the town, its history, what Hermanus is famous for and some fab little stories / myths about Hermanus, then its time to start Wine tasting……..If you do not wish to do this little extra trip (15 to 20mins) and you wish to get stuck into the Wine tasting, then that’s totally cool with us, please inform me of your wishes. Our Hermanus local tailor-made Wine Tours (collections from any location within Hermanus) - start at R550 per person for 2 hours and each additional hour is R100 per person per extra hour - kids go for free. This includes your Tasting Fees that each Winery charges of between R30 to R60 per person per winery. Exclusive luxury air-con vehicle with many comforts on-board. For collection addresses outside of Hermanus - or - Wine Tours to wineries outside of Hermanus, then please Contact Us for quotes. We can start your wine tour at any time you desire, but most people prefer a leisurely start of 10.00am / 11.00am as they don’t wish to taste wine with toothpaste and breakfast still on the palates.